Pesto is tremendously versatile, it can be used in a simple pasta sauce, spread on sandwiches and even spooned over a baked potato. It can also be as used a wet-rub for fish, meats and vegetables for grilling. This recipe demonstrates one of the simper ways, using it as the base for a pasta sauce. 3. Add the sliced sundried tomatoes and let come to a simmer. 4. Stir in the pesto and mix well. 5. 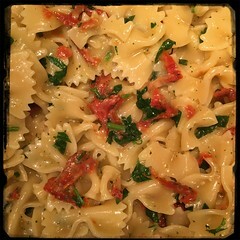 Add the cooked pasta and stir well, adding a handful of chopped flat-leaf parsley at the end.